Maoists ambushed a team of the Central Reserve Police Force (CRPF) in Chhattisgarh’s Sukma district on April 24, 2017 and inflcted heavy casualties. The Maoist attack has sent shock waves across the country and people are raging. Newsroom24x7 is publishing this piece based on a speech deliverd on September 29, 2011 by Election Commissioner O. P. Rawat in his then capacity as Madhya Pradesh Additional Chief Secretary. His extremely objective remarks are pertinent even today. Bhopal: Election Commissioner O.P. Rawat, while speaking a couple of years ago at a seminar on the Maoist Problem in the capital of the central Indian State of Madhya Pradesh, had drawn attention to the issue of democratic deficit and had underscored the point that once all kinds of deficits are slowly brought to zero, a handful of revolutionary thinkers whether Maoists or naxalites, they cannot do anything to our country and our democracy will go from strength to strength and we will flourish. 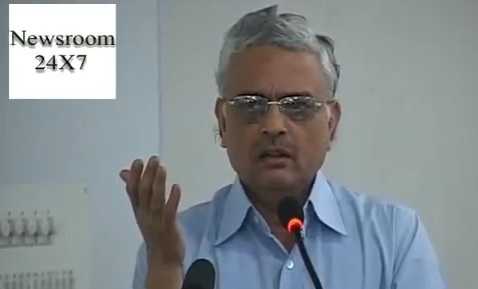 Rawat, in his then capacity as Madhya Pradesh Additional Chief Secretary and Vice Chairman Narmada Valley Development Authority, had made this assertion at a Seminar on the theme “Maoist Problem” organised here on September 29, 2011 by Newsroom24x7.com and RCVP Naronha Academy of Administration and Management. On this occasion, the keynote address was delivered by late D.M. Mitra, a top ranking Indian Police Service officer who was then holding the post of senior Advisor Madhya Pradesh Planning Commission. With so much of democratic deficit, How can a government be pro-poor, pro-electorate and serve their interest. They will only serve their own interest by using the bureaucracy, the police and every other instrument of State apparatus to serve their cause and the drama is unfolding every day in the newspapers, in the media everywhere. You are all witness to that. The fiight everywhere – whether it is in government, whether it is in society, or in the Maoist area – every where it is the fight between the haves and have nots. Everything boils down to one thing, if governance improves in the interest of poor, not in the interest of the powerful, if empowerment takes place of all the poor and marginalised people, if education reaches them, if irrigation reaches them, if their livelihood is secure, if implementation of government policies and programmes, enforcement of laws is done by informing the poor and making the poor enlightened and making them feel that the Government has eyes, ears and hands to do justice and do everything in judicious manner. But what is happening? Take the example of the implementation of the Scheduled Tribes and Other Traditional Forest Dwellers (Recognition of Forest Rights) Act. One statistics said there were around 80,000 people who have possession over forest land and they have been cultivating and on the appointed day, i.e., 13 December 2005, they were in possession (of land). With lot of effort, awareness raising, nukkad natak (Street plays), TV, radio, gram sabhas (village general bodies), capacity building of about 1 crore people of gram sabhas, with all that effort and translation of the Act, rules and everything in their own dialect even then awareness level was not adequate. But with all these efforts, we ensured that gram sabha adjudicates confidently with full knowledge of law, rules, regulations and I think till date only about 1.5 lakh title deeds have been distributed. In other States, without naming them, I would say that against a recorded number of 40,000, 3 lakh to 4 lakh (title deeds) were distributed without going through the process of adjudication, without involving the people who really knew. And (as a result) what is the impression created in the minds of the tribal or in the minds of the poor fellow is that government is not only blind, deaf and dumb but is also without hands and does not know anything about what is happening and in the process, a person who was just not there – the lone shark has also got the title deed. This kind of turbulence, this kind of dissatisfaction, this kind of frustration gives a ready-made population -whether they are young or old, everybody – all cannot act so they would not join but would within their mind and heart feel “let them die” , let something happen against them. The young, who have the energy, will of course join as they have the guts, they have the time. If this is recognised and ensured – unfortunately what happens is that the invisibility in terms of officers and others sitting in the State capital – Mantaralaya or the HoD’s buildings they are conditioned to please the political masters otherwise their own existence in those chairs will be at stake and political masters, if they do not suffer from democratic deficit will be all right but most of them are suffering from democratic deficit. If there is 50 per cent voting and if a candidate gets 40 per cent of that it means a candidate of any party getting only 20 votes out of hundred wins. That means 80 per cent are not in favour of that government which is ruling the people. With so much of democratic deficit, How can a government be pro-poor, pro-electorate and serve their interest. They will only serve their own interest by using the bureaucracy, the police and every other instrument of State apparatus to serve their cause and the drama is unfolding every day in the newspapers, in the media everywhere. You are all witness to that and this must be recognised. I think efforts are on because we are not all sitting silent. The Election Commission of India has set up an institution for Democracy and Electoral Management. They have done wonderful work. Last elections, the voting percentage shot up to 87% in one State, which is a record. Never before in the history of Indian elections, 87% or 88% polling had taken place in any state. This will bear fruit and surely bring all kinds of deficits slowly to zero. That will be the day when a handful of revolutionary thinkers whether Maoists, naxalites or anyone they just cannot do anything to our country and our democracy will go from strength to strength and we will flourish.